Last year, without any specific idea, I started to collect all the bottles of my spinning classes, until I came up with the idea of doing an installation with them. I turned the bottles into flower pots with a home-made self-irrigation system, dividing each bottle in half where by means of a thread the plant gets water arriving from the bottom of the bottle; the thread rises through the entire pot until it ends in a reflecting helium balloon. This installation is a metaphor based on Buddhist philosophy, where we talk about the idea that the world we experience is a mere reflection of our mind. 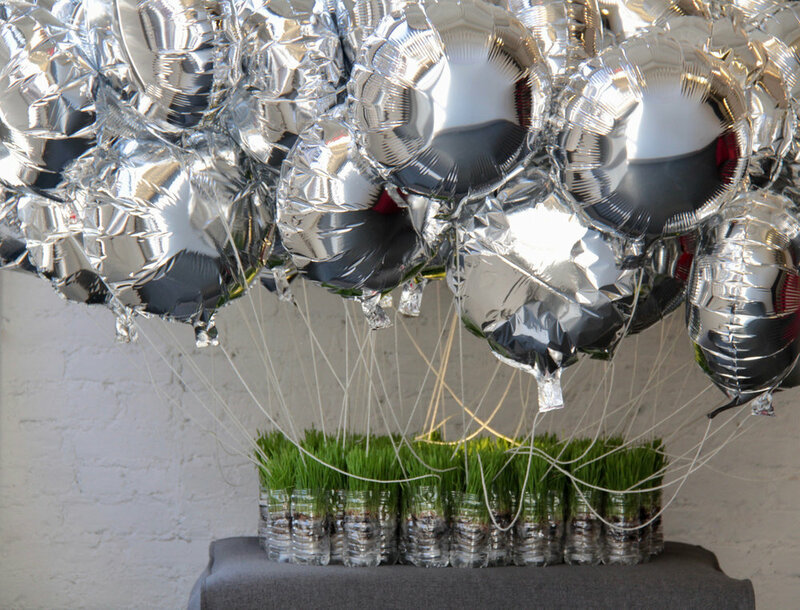 The water in the bottom of the bottles represents all those things with which we nourish ourselves (or undernourished) day by day; the grass represents life; the thread represents that energetic and spiritual channel, the conductor that makes the connection between mind and matter; Finally, the balloons represent the world, which is going to reflect exactly what we want, in this case, all the bottles with grass under the balloons. I get involved in an active meditation with this series of string pieces. If my mind is tense and full of noise, I cannot tense the string straight. If my mind is relaxed and focused, the string becomes straight and steady. These pieces are a great exercise for observing my mind. If I don’t take responsibility for my thoughts, what am I going to offer to the world? I wish this could always be something beautiful. The next pieces that I want to do following this series will be using 100% natural threads from the mountains of Oaxaca or Chiapas. A future project I would love to carry out consists of integrating myself into some community and really learning the technique of threading. After living for two months with this community I would return to my studio and combine the techniques I learnt with my creativity and see what comes out of that effort. This project excites me because it is an opportunity to connect with my Mexican heritage.